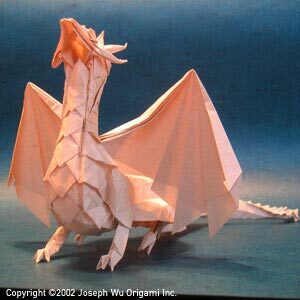 Folded from five sheets of paper (head & upper neck; lower neck, chest, & fore legs; haunches & hind legs; tail; wings). This model is to scale, although it doesn't really qualify as a miniature. It corresponds to an ancient dragon, about 90 feet long.